ICRC surgeons and anaesthetists work as part of surgical teams sent in when existing facilities are unable to care for the war-wounded. They may also treat victims of accident and illness who require emergency surgery. The teams work either in hospitals built, equipped, and managed by the ICRC, or in existing hospitals that the ICRC provides with supplies, equipment and back-up for local personnel, in some cases assisting with training. 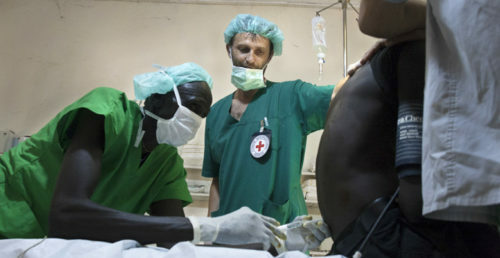 The anaesthetist, as part of an ICRC hospital team, performs safe pre/per and post anesthesia procedures for emergency and elective surgical interventions, often for the benefit of trauma and weapon wounded individuals. S/he works in assisted or ICRC independent hospital structures, often in limited resources settings and challenging security environment. Perform anaesthesia during surgical interventions, in line with the internationally/ICRC recognized standards, and provide adequate patient post-operative care. Organize, coordinate and ensure that all required resources are available to conduct safe anaesthesia procedures. With the other members of the ICRC surgical team, he/she provides technical advice and supports local counterparts to maintain/develop the local capacities and reach international standards.